SMG-managed Van Andel Arena teamed up with the Pamella Roland DeVos School of Fashion Studies of Kendall College of Art & Design of Ferris State University (KCAD Fashion Studies) to design something special for Elton John’s visit to Grand Rapids, a garment for Elton himself inspired by the many looks he has flaunted throughout his career. 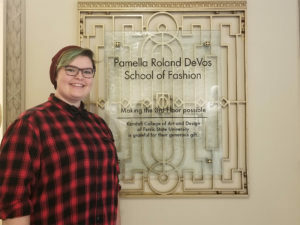 Ten KCAD Fashion Studies students submitted a collection of three different outfits, and each collection was displayed and voted on by the public on Van Andel Arena’s Facebook page. Student #2, Danielle Cavinder, received the most fan votes for her Elton John Collection inspired by his Farewell Yellow Brick Road Tour. Cavinder will receive a $1,000 scholarship for her work, and one of her winning garments will be displayed backstage near Elton John’s dressing room on Monday, October 15, at Van Andel Arena. In addition to Cavinder’s winning garment all 10 KCAD student’s design sketches will be on display backstage at Van Andel Arena for Elton John’s Farewell Yellow Brick Road Tour on October 15.